So Do We Want To Know What Britain Is Really Like For 14 Million Of Its Citizens? Last week, 16 November 2018, Professor Philip Alston, international lawyer and UN Special Rapporteur on extreme poverty and human rights made his statement on the shameful state of Britain. He began by pointing out that the UK is the world’s fifth largest economy, yet one fifth of its population live in poverty. Of these, 1.5 million are destitute. The reasons for this, he says, are largely ideological, and government ministers are so fixed on their agendas, they are refusing to acknowledge the evidence presented to them, or acknowledge the consequences of their policies. The problems, Professor Alston states, are set to grow worse, and especially for the most vulnerable: CHILDREN. Amber Rudd, the new Work and Pensions Secretary dismissed the report on the basis that its tone was ‘highly inappropriate’. Philip Alston’s response, as covered by the Guardian, was to tell her to take action rather than criticise. Many thanks to Dear Kitty. Some Blog for drawing my attention to this video. By way of a brief intermission from the on going Greek series, here is the sun over our Shropshire garden at around midday yesterday. 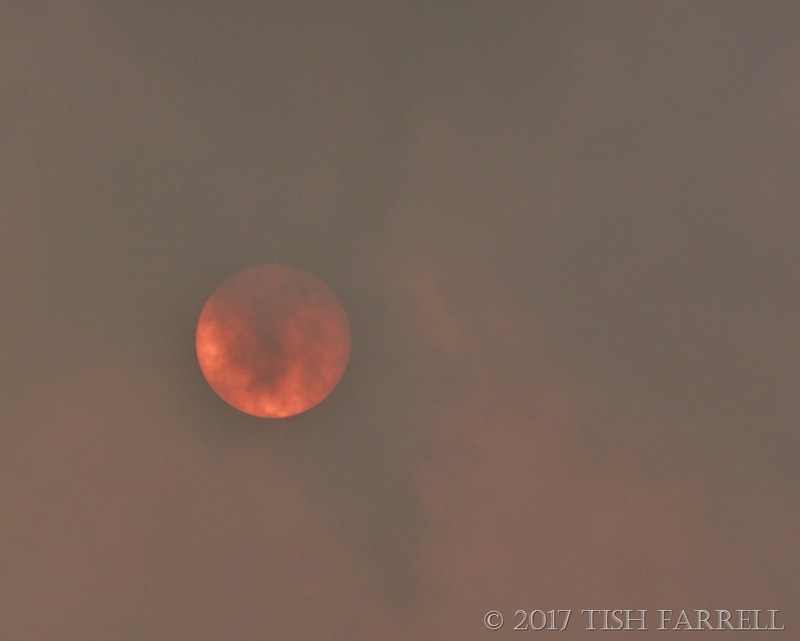 The tail end of Hurricane Ophelia had apparently whipped up the dust of Africa along with the ash from the tragic forest fires in Portugal and Spain and so created this apocalyptic orange twilight complete with rosy sun. Nothing to do with us of course, all this global mayhem. The lych gate is of course the corpse gate, the covered entrance wherein the dead might be laid until a funeral could take place in the parish church. In the past there was often a several day wait for this essential ceremony, during which time the deceased must be shielded from bad weather, robbers and worse. 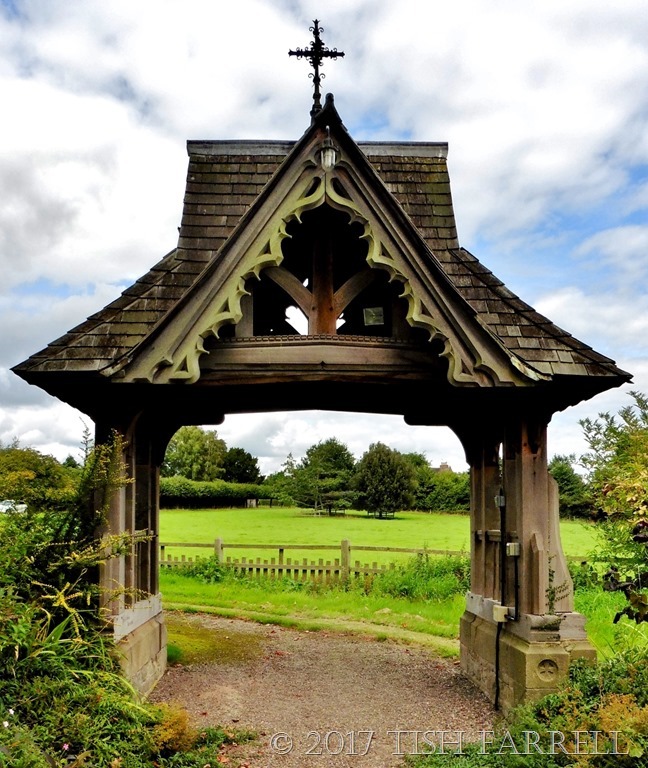 This particular lych gate stands on the path to Morville’s parish church of St. Gregory. 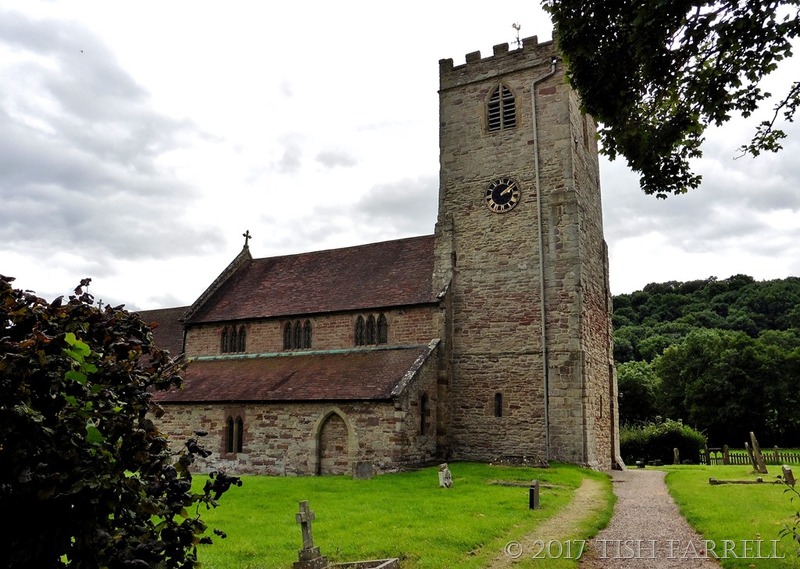 Morville, itself, is a small hamlet on the main road between Much Wenlock and Bridgnorth, and like Wenlock has a monastic past, although the church is all that remains of this period. 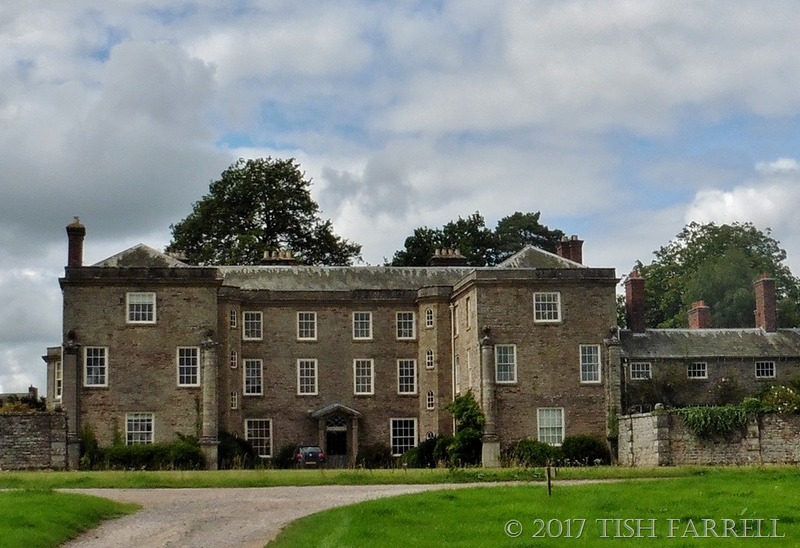 I suspect that the fabric of the actual monastery may well have been re-purposed in the building of the next-door Morville Hall, which began hot on the heels of Henry VIII’s Dissolution of the Monasteries in the 1540s. In Saxon times the place was a thriving manor, and after the Norman invasion of 1066, continued to be so, its existing church and associated lands bandied about as pieces of valuable real estate in deals between kings, earls and churchmen, its native inhabitants bound by fetters of superstitious dread and the obligation to provide wealth and labour for their overlords. 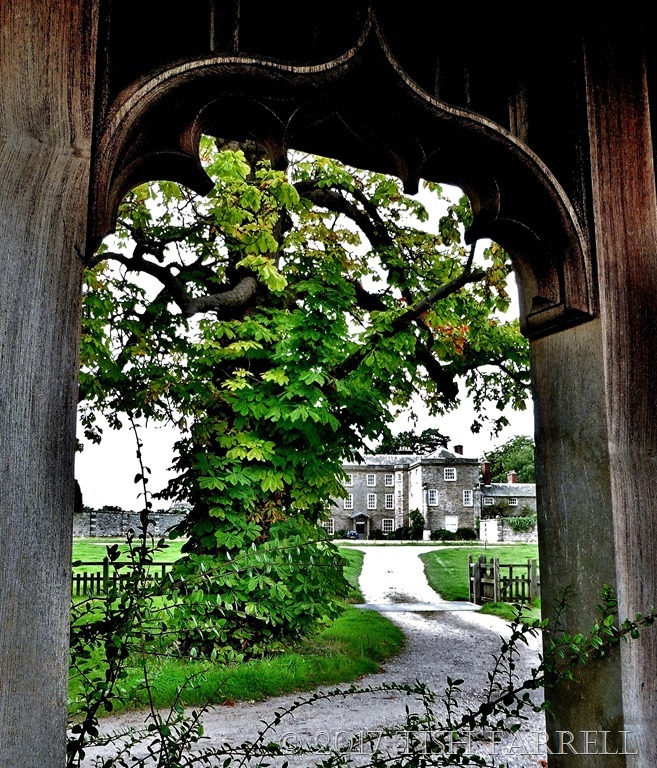 The Norman earl Roger de Montgomery took over Morville (along with most of Shropshire) in 1086. Here he had built a Benedictine monastery, an outpost for his more prestigious Shrewsbury Abbey some twenty miles away. He also had Wenlock’s Saxon priory remodelled on a monumental scale, and ordered the building of numerous other religious houses in every adjacent small community across the county. I do not think this extensive building programme had much to do with piety. This was first and foremost about stamping Norman authority over the land. It was also an overlord’s means to control people, the wealth they created, and by the ordering of good works from the wealth accrued, so ensure his own place in heaven. It was his insurance policy in an era when everyone lived with a mortal terror of hell and the devil. As Baldrick in Black Adder might say it was a very cunning plan – political, physical and psychic control all of a piece – a top-down wealth management strategy. If you go inside the church you may see, as you will in many old churches, the evidence of the psychic tyranny. The present building dates from the 1100s. 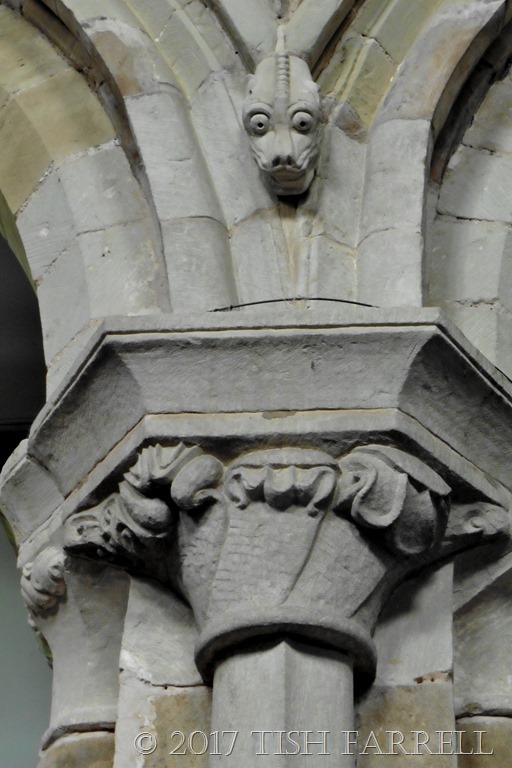 Between the column arches on both sides of the nave, serpents slither down – an early medieval manifestation of ‘fake news’ perhaps? Imagine having them breathing down your neck every Sunday from infancy to grave. There was no opting out of the experience. Your very soul was in peril should you try to, and anyway this and the other snakes are endlessly hissing at the horrendous cost of becoming an outcast. 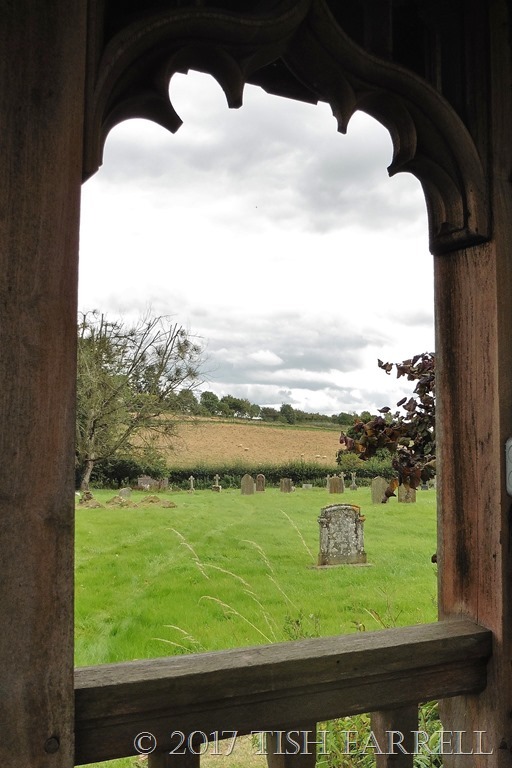 Today, the church in its country churchyard and the nearby hall are quintessentially scenic. My senses tell me that this is a lovely spot. But I confess, too, that increasingly I struggle with the rustically picturesque and the meaning I take from it. …that ultimately distasteful sense of nostalgia for a fake past of benign lords and grateful retainers. We may have Henry VIII to thank for loosening a little the stranglehold of the ruling elite, and broadening the class of major players to include merchants and professional men, but nearly five hundred years on, most of the country is still owned by small and powerful factions including the monarchy. The fascinating thing is most of us don’t seem to notice, or realize how the way land continues to be controlled affects our lives in critically fundamental ways – the cost of a home – to buy or to rent – and the acceptance of ever-rising property ‘values’, the acceptance of mortgages for life. It is not for nothing that these holdings are referred to as ‘land banks’, or that any release of land for development is minutely managed to ensure maximum return from high priced, often poorly built, overcrowded properties. We no longer have to plough milord’s fields, or give him our tithes in wheat and eggs, or bow to his whims, and tug forelocks, but the vestiges of feudalism are alive and well and residing in Britain, and more particularly, idling in its well-worn seats in the House of Lords, currently the focus of ‘a bit of a scandal’ as reported by the Electoral Reform Society. Of course we could do something about all this – if we really wanted to – if we stopped romancing about the past and started planning for a present that embraces everyone’s needs. It’s an interesting thought anyway. Have We Reached Peak Stupidity Or Is The World Just Pants? It seems French entrepreneur, Arthur Menard, had become so concerned about the health of his and other men’s testicles that he set up SPARTAN, so providing a new brand of chaps’ protective undergarment. This is all highly commendable of course. The reproductive health of present and future generations is clearly at stake here. We cannot have a scenario wherein the human race is wiped out due to obsessive compulsive Smartphone, laptop and tablet usage. That would be too daft, wouldn’t it? Except somehow, you can see it coming can’t you – our endlessly driven pursuit of pleasure gizmos and our too small grasp of the unintended, multiplying consequences; the outcomes – like ‘fake news’, ‘fake presidents’, social media tyranny and manipulation of reality that, to my mind, truly are pants. No cotton and silver mesh to shield us from that kind of fall-out. False Horizons On The Way To The Allotment: A Not So Bucolic Picture? 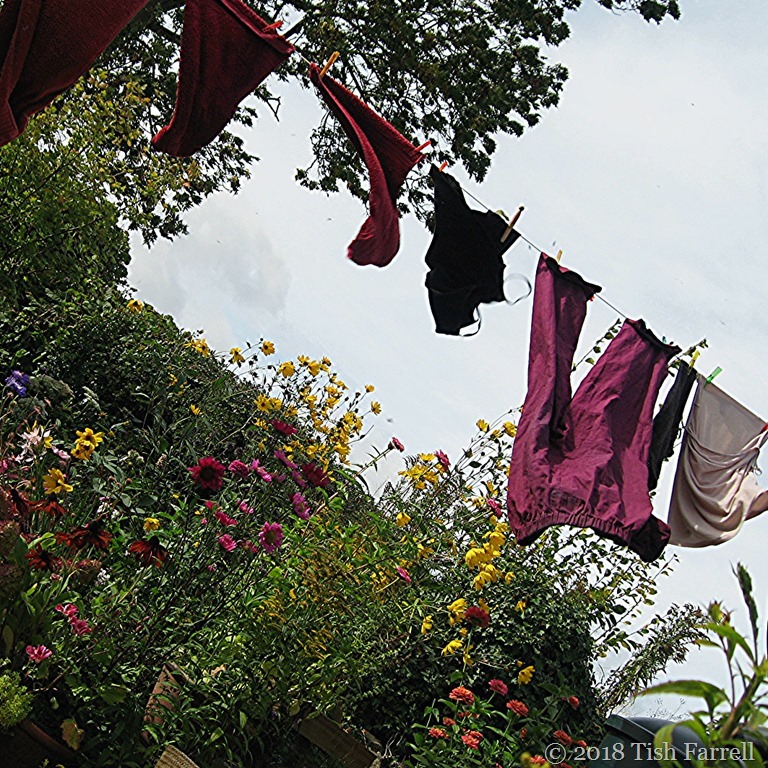 I usually have a camera with me when I go gardening. The field path from our house to the allotment provides many diversions; opportunities to stand and stare. And also there’s often something to snap around my plot. I took this photo just over a week ago. Even then the wheat looked more than ready to harvest. 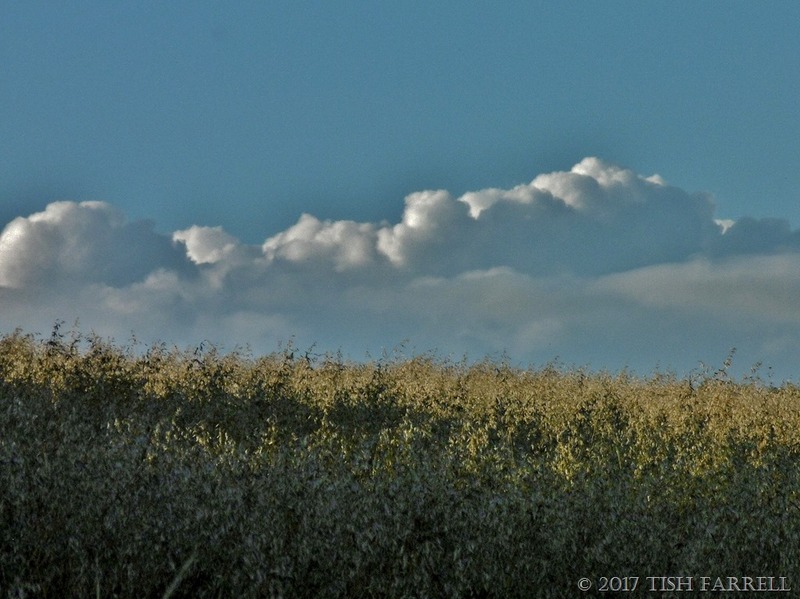 But it was infested with wild oats, hence the feathery ‘horizon’ seen here above the wheat. Earlier this week, while I was picking runner beans, I heard the roar of an approaching tractor, and looked up to see the farmer on his mega vehicle, massive spraying rig in action. He was dosing the fields behind and beside the allotment. Then the breeze got up. “Roundup,” muttered my allotment neighbour crossly, he who also happens to be an agricultural consultant of many years standing. “Just look how it’s drifting.” It was definitely coming our way. We don’t use weed killer so we had a mutual humph. What else could we do? Roundup is the most widely sold weed killer in the world. It’s main active ingredient is glyphosate, but it is also combined with a number of apparently inert adjuvants. These are substances that are added to accelerate, prolong or enhance the action of the main ingredient. Adjuvants are also added to vaccines for similar reasons, but that’s another story. …glyphosate can follow the grain into our food. Tests by the Defra* Committee on Pesticide Residues in Food (PRiF) found that almost two thirds of wholemeal bread sampled contained glyphosate. all had glyphosate traces in their bodies, with the average concentration being 1.7 micrograms a litre, 17 times above the limit for drinking water. With ongoing controversy over the health risks of glyphosate, we can be quite sure it has no place in the human body. We hold concerns for its impact on biodiversity, with evidence of glyphosate having detrimental impacts on the honey bee, monarch butterfly, skylark and earthworm populations, and posing a threat to the quality of our soil. Well why would I, or anyone want to eat weed killer? Wishing the Kenyan people well on this their election day. Yesterday. The perfect summer’s day. 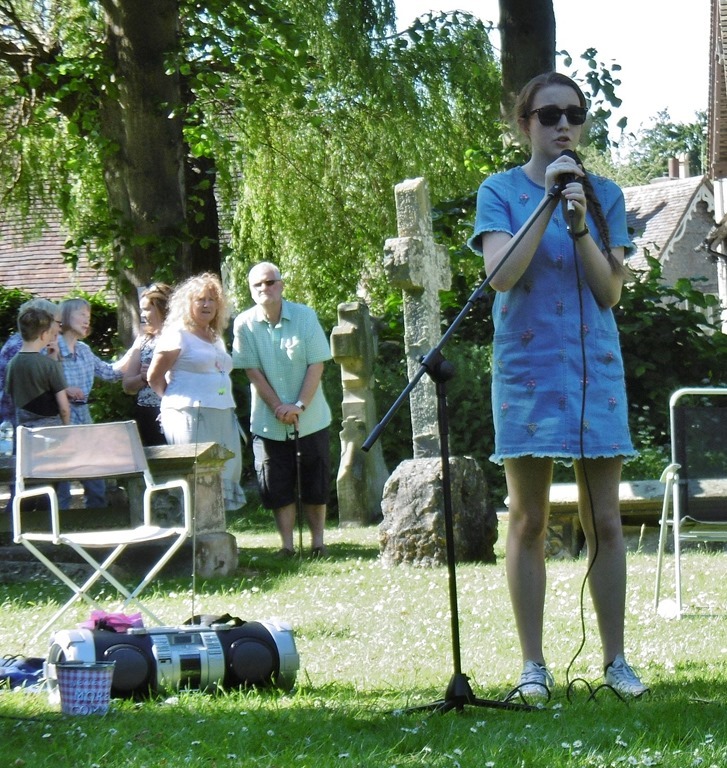 And here are the people of Much Wenlock gathered on the Church Green in a Great Get Together picnic, organised by the local community group Building Bridges Not Walls. It was of course only one of the 120,000 events being held this weekend across Great Britain to celebrate the life of Jo Cox, the vivacious young Labour MP for Batley and Spen, who stood for community, togetherness, tolerance and diversity, and who was tragically murdered last year. 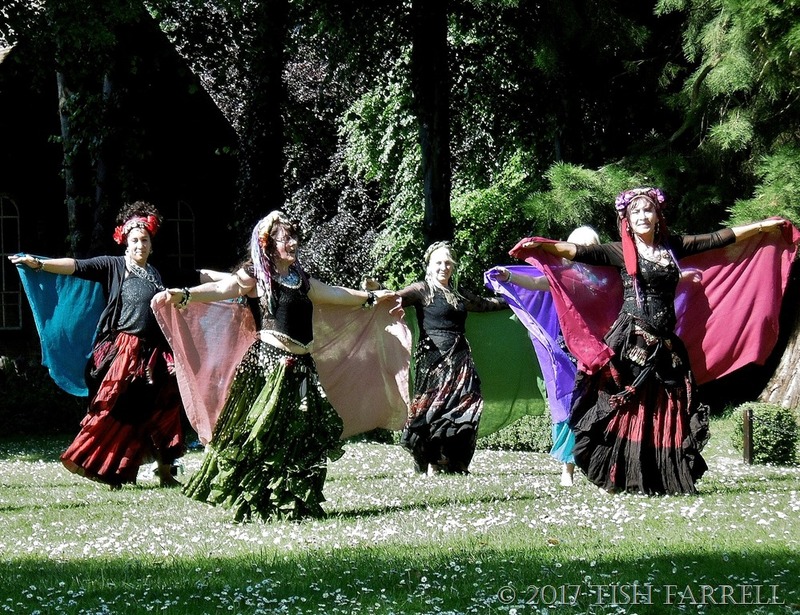 So we came together to make a stand against those who would divide us, and we did it with poetry, Turkish dancing, song, and soothing tabla rhythms. Swallows and swifts swooped overhead. 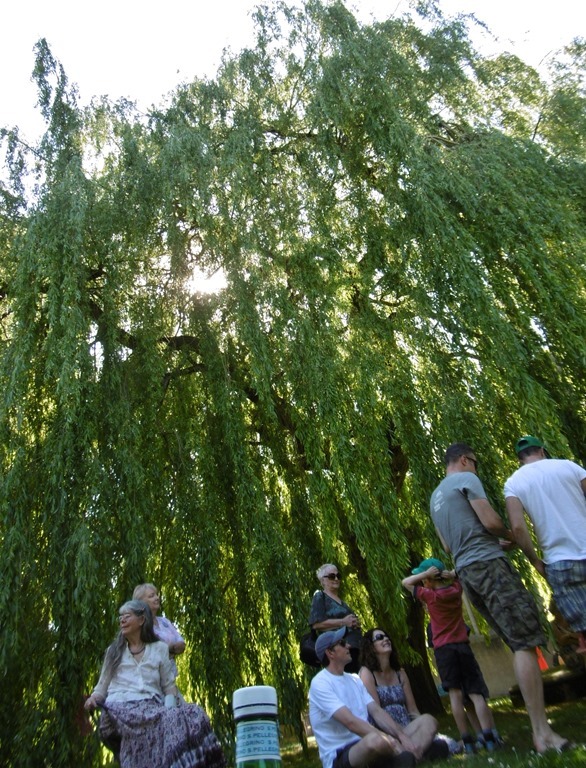 The churchyard willow provided ample shade and dappled light. Assorted dogs came along too. Children clamoured to have their faces painted, and the place hummed with convivial chatter and good fellowship. 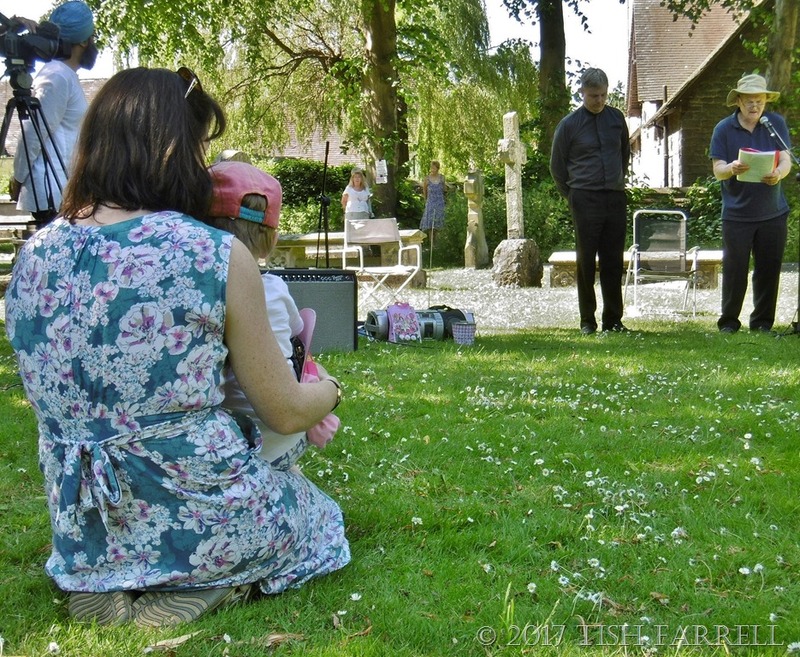 And somewhere amongst it all there was a BBC film crew making a programme about life in a rural parish, featuring our Rector, Reverend Matthew Stafford. 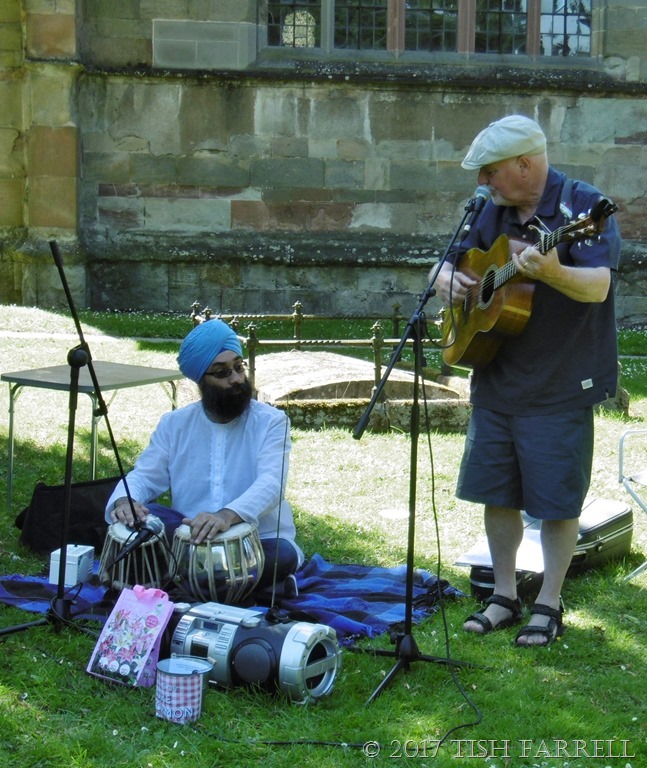 Tarlochen on tabla, Ian on guitar and vocals: and a fine happenstance partnership it turned out to be with an ace version of Eleanor Rigby. And never was there more urgent need to embrace these words and embed them in heart, body and mind. Around the globe so many are locked in a constant state of divisive, calculated ‘them and us’ posturing, pawns in the too many ‘emergent occasions’ of the hate-filled, dogma-driven, racist, resource-grabbing, xenophobic, war-mongering sort that are instigated, managed and fuelled by the self-serving few. And now we have a ‘world leader’ actively promoting nuclear proliferation because, he says, his nation should be top of the pile in the arms race. That would be the nuclear dust pile then? For those of us who were here the first time round – it’s back to the madhouse. How did we let this happen? And what are we going to do about it? Who Sells The Pasts-That-Never-Were ~ Are We Seeing The Danger Signals? 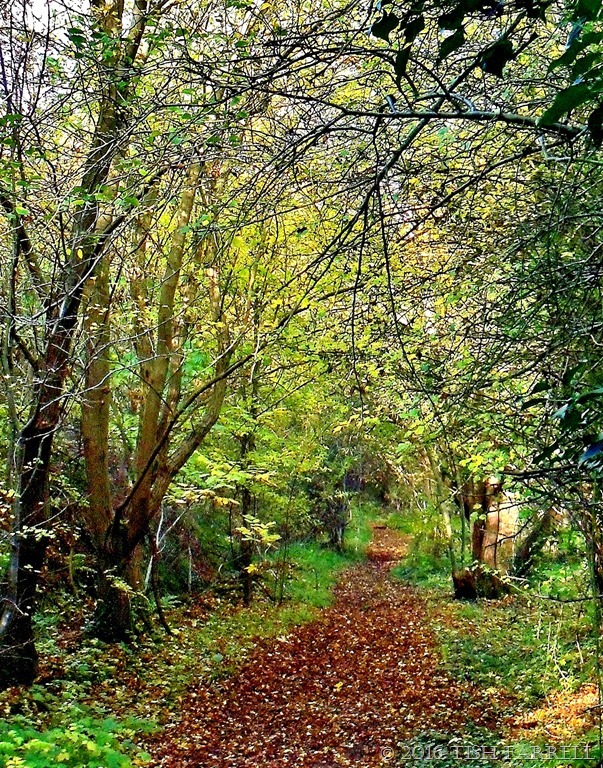 I’ve cropped and re-cropped this image in hopes you can put yourself right there on this path amid the fallen leaves. I’m hoping, too, your eye will be drawn further down the trail, that you will be wondering what lies beyond: where is this path taking us? The ash trees and goat willows arching overhead make the path tunnel-like; mysterious, but not threatening. Slashes of light fall in from the right. They relieve the gloom of the overgrown embankment on the left. Other impressions might occur. That this is a peaceful place: a perfect resort from the technologized maelstrom we have created for ourselves. 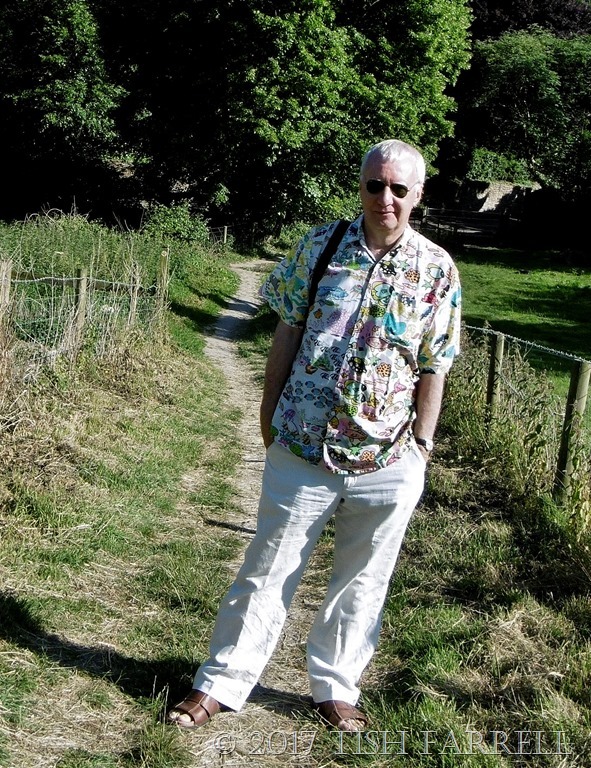 That it must be especially lovely in summer: birdsong and windrush through the greenery. Love-sick souls might wander here; those seeking solace from other cares; writers who have lost their plots; small boys intent on secluded thickets for a new den; dog walkers; girls on ponies: all seeking, consciously or not, the perceived restorative, imagining powers of wilderness. As you take in the scene I might tell you that where you are standing is an ancient green lane, a once busy rustic thoroughfare used for centuries by the lay workers of Much Wenlock Priory. You can imagine them hauling carts of grain to the mill for grinding, or mule trains bringing in bales of wool from a shearing of the Prior’s flocks. I could throw in tales of St. Milburga, the seventh century abbess, who was renowned for striking springs of pure water from bare rock, or tell you that this path was one of the haunts of resistance fighter Wild Edric, the local Saxon lord who challenged Norman rule. But no. That’s not it at all. Nothing in that last paragraph happened here as far as I know. What a shame. It had all the makings of a good yarn. We were beginning to identify with the characters. We were starting to confer on them certain notions/images/memories, conjuring a past we think we recognize. Wait though. Here’s another version. Into this tranquil scene comes what? A TRAIN? Turn around and you will see what all the din is about. A large locomotive is rumbling out of the railway siding. It is hauling many wagons loaded with limestone from Wenlock’s vast Shadwell Quarry, which lies out of your sight behind the path embankment. The limestone is destined for the furnaces of South Wales and the West Midlands Black Country, used as a flux in the smelting of iron. This scene belongs to the 1860s when the United Kingdom was still a world leader in heavy industry, the monster-offspring of the 18th century Quaker Ironmasters who pioneered iron-making techniques just a mile or two away in Coalbrookdale. Other scenes can be added: weekly earth-shattering blasts from the quarry; the land, lanes, town in a grey-dust pall; air filled with fumes from lime-burning kilns; a man burned one day in a kiln collapse; Wenlock’s Town Council of the late 1940s complaining that the blasting was shaking stones from the Wenlock Priory ruins; 1981 and rocks from a quarry blasting landing on the neighbouring secondary school, injuring three pupils. 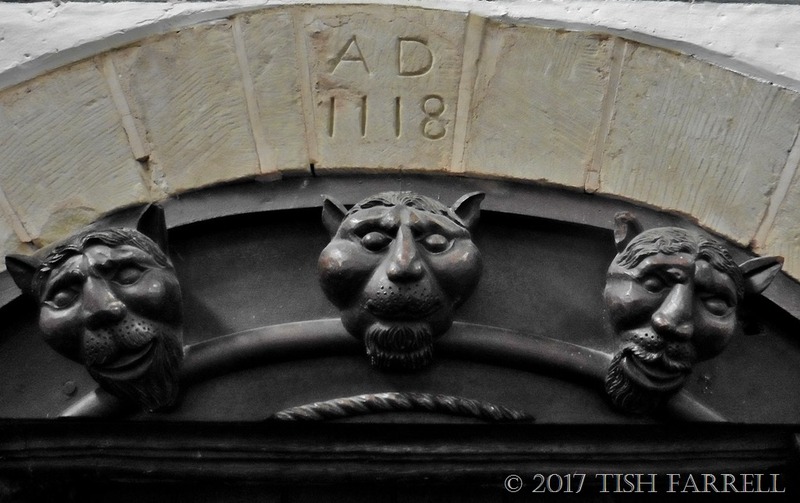 Here then are a few clips from Much Wenlock’s many ‘pasts’; ones that actually happened. The path you are standing on is the track bed of the former Severn Valley Railway branch line. It once linked Much Wenlock to the rest of the world in a way that the River Severn had done in times past. This railway once served the nation’s industrial heartlands. And most of us have forgotten this now. Or never knew it. Looking at it now, it is anyway hard to believe. In this particular case our forgetfulness or ignorance or disbelief is probably of little consequence. We have a lovely place to walk, and doubtless most of us will protest should anyone try to turn it into a car park or a housing development. I still have a niggling query. Should we not all be a good deal more knowledgeable about own histories, the actual lives of parents, grandparents and great grandparents? Should we not all be well versed in our nation’s last hundred years, including understanding our responsibilities as citizens, and knowing precisely how our land and its people make a living? I’ll leave these questions with you, because I want to talk about the quotation. It has haunted me for decades, and is the opening line of L P Hartley’s novel The Go-Between. But it was not in the novel where I first read these words. My first encounter was in the title of quite another book. It was 1985 or 1986, and the book in question had not long been published. At the time I was employed as the seemingly grand, if poorly paid Leverhulme Research Fellow at the Ironbridge Gorge Museum Trust. (This being the sprawling Shropshire heritage enterprise that lays claim to protecting and interpreting the ‘birthplace of the Industrial Revolution’ aka the aforementioned Coalbrookdale – a location which thus has a very great deal to answer for). Lowenthal’s book The Past Is A Foreign Country is regarded as one of the classic works of cultural history. It was described by one erudite reviewer at the time as ‘a meditation on misuses of the past in contemporary culture’. In the light of recent events – the outcome of the US election and Britain’s Brexit vote wherein proponents’ projection of a perfect national past formed a key part of the ‘sales’ pitch – it seems to me that this is a phenomenon that should worry us all. The past that was being sold was not an old past either, but one deemed to be within someone’s living memory – you know, that happy land just over the brow of the hill where everyone resides in the rosy glow of unchallenged prosperity and inviolable national sovereignty and with no incomers. When did that place have its heyday? Can anyone tell me. I’ve been alive quite a long time, and I can’t pinpoint it. When I grew up in the 50s there was still post war rationing. Kids were getting polio. Pregnant unmarried girls were considered the scum of the earth, and hustled into homes. Racist language was the norm. Homosexual acts were criminal offences. There was the Korean War, the Suez Crisis, the Kenya Emergency, the Malayan Emergency, the Cuba Missile Crisis. The Cold War threat of nuclear missile strikes hung over us for decades – fear still lingering until 1989 when the Berlin Wall came down. All local authorities had their nuclear bunkers in place. Some are still extant. It is doubtless a common human affliction to wish to turn back the clock whenever things go badly wrong. It also a well held fallacy that there is some perfect place from which humanity has been excluded – a sort of expulsion-from-Eden syndrome – and that maybe we can get back there? …we also preserve, I suggest, because we are no longer intimate enough with that legacy to rework it creatively. We admire its relics, but they do not inspire our own acts and works. The past has become commoditized as escapism, a state endlessly replicated in the kind of costume dramas that lure us into thinking that people back then thought just as we do. It is an on-going process of re-invention that becomes ever more ‘real’ and so I think predisposes many us towards a hankering for a past that contains none of the things that so upset us now. It was so much better then. Wanting to turn back the clock to a time-that-never-was suggests feelings of helplessness and hopelessness; of depression, hardship and broken spirit. Hanging on to such a notion is obviously not going to help solve any of the problems that face us. In the short term it leaves us vulnerable to those who would sell fake pasts for our future salvation (and politicians have always manipulated history to confound us – some on a megalomaniac scale). In the longer term, when the lie is exposed, it will bring only further incapacitating disillusionment. It might bring worse too. And how did we get into this position – we, the rich nations of the northern hemisphere? How did all our great assets reduce us to such impoverished and desperate ways of thinking? Why do we not know enough about ourselves and our nations to see off the self-serving opportunists who feed us fantasies and divisive hate-stories? These are questions that surely have very many answers, and for now I’m leaving them with you too. Interestingly, David Lowenthal decided to do a re-write of his book. It came out last year.The Past Is A Foreign Country – Revisited. It earned him the 2016 British Academy Medal, and here’s a nice review by Robert Tombs. The reason he apparently chose to do a new book was because the past he had addressed in 1985 had, over three decades, been so transformed as to be an entirely new realm. Well, who’d have thought it! I have this mad, optimistic hope that one day we might get some slight grip on reality – before it gets a grip on us. And now it’s clearly time I took a walk. Back up the old railway line then. It is far more peaceful there. 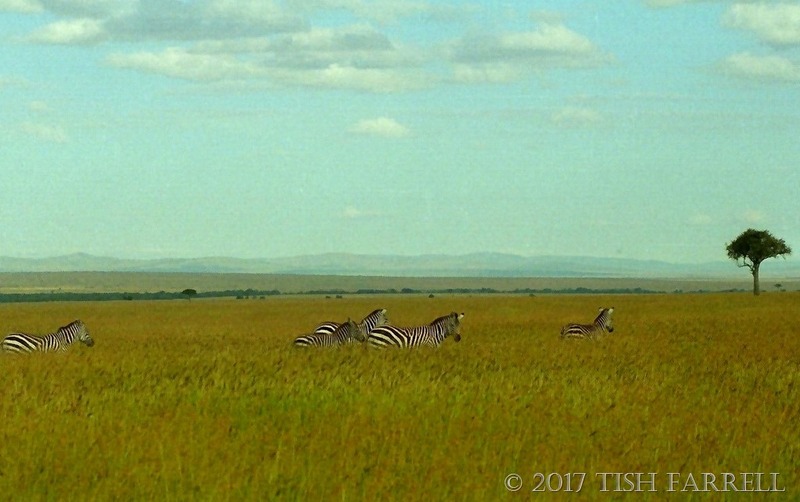 This post was written as a result of recent ‘conversations’ with poet Robyn at Jambo Robyn and scientist Swarn Gill at Cloak Unfurled. Many thanks both for the thought-provoking exchanges.